Why Should Sexual Orientation Matter? Your sexual orientation can prove a barrier to getting back into work, even though it shouldn’t, if you have a narrow-minded potential boss for an interviewer. At the end of the day, if they cannot accept your sexuality in an interview, you are going to have more problems down the line and that speaks volumes for the type of ship they will run. Yes, it’s true you don’t have to mention your sexuality in an interview, and I am not saying you should, but you can’t hide it forever – What happens when you are seen in town together with your ‘partner’, or you get asked to bring your ‘partner’ along to the Christmas party. And although you can’t be asked about your orientation as an interview question, you usually have to fill in an equal opportunities monitoring form. If this is done and handed it at the interview stage, and they know your orientation without asking it, they may use subtle questions to ask you about it or it may go against you, so just be mindful of this. I was once asked in an interview if I liked to go out with the girls from work clubbing – this should never have been asked in an interview. At that time I didn’t, and surprise, surprise, I didn’t get that job for a retail assistant at a young women’s clothing fashion brand, which eventually closed down. The girls in the shop, clearly wanted me to say I would go clubbing with them. Now, I do like going clubbing sometimes, but it’s not the point! Break Through The Barriers Of Redundancy Book Pre-Launch Excitement! The moment has finally arrived when I am going to be a published Author very soon. I am so excited! I just launched a new Break Through The Barriers Of Redundancy Book – Author Sandra Bellamy Facebook page. It would be amazing if you could Like it as I haven’t secured the page name yet – I need at least 25 Likes to get the name, sometimes it’s more, and I want to put the page name in my book, so the race is on. I believe this book is life changing for me and I hope it will be for a ton of others too. Here is the Facebook link www.facebook.com/pages/Break-Through-The-Barriers-Of-Redundancy-Book-Author-Sandra-Bellamy Although my book is aimed at redundant workers, because it takes a holistic view of redundancy and getting back into work, it really does tackle a lot of well-being, confidence building and self-love issues, before dealing with the practicalities of job-hunting. I have to check all of my hyperlinks work and then convert the manuscript to HTML for Kindle. Then -oooohhhhhh!!! It will be published Author time!!! So in these next few days/week – I should be able to proudly say that Sandra Bellamy is a published Author of Break Through The Barriers Of Redundancy To Get Back Into Work: – An A-Z ‘How to’ guide. Hi, it’s Sandra from http://www.quirkybooks.wordpress.com. I am going to be a published Author soon and I cannot wait! I spent four nights trying to reformat my book for Kindle and had no joy, and I think I have finally cracked it with the Table Of Content hyperlinks .. and I am so excited because I am just day, hours, away from being a published Author and it’s my dream. After two and a half years of making this book – Break Through The Barriers Of Redundancy To Get Back In To Work – An A-Z How To Guide, I shall be finally there. Wow! It’s going to be incredible. I cannot wait! I am just so excited! It’s going to change my life, it’s going to help a ton of people and I just love it! I love helping people. I love writing. Oh my gosh to just be writing all the time again, was amazing. I took some time out of my day job – holiday – to do my writing of my book and I was spending ten hour shifts doing my writing and editing and amending, and it’s really hard work, really really hard work, but it’s so beautiful, I felt so at peace and at one with life and it’s absolutely fantastic! I have just been doing Facebook training with someone for their business, because I do Facebook and Twitter and Blogging training for business and that’s all great too, so you may see some books in the future, or a book about one or more of those subjects. More Quirky Books on the way. 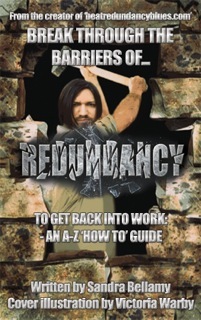 This Break Through The Barriers Of Redundancy book is incredible, it’s a complete A-Z guide for getting back into work and it takes a holistic view of redundancy. It’s all about going back to your inner being to the roots of who you are and what you were born to do before all the noise got in the way, the kids, the mortgage, marriage. Or just when life take it’s ups and downs and doesn’t quite go to plan, how you would want it too. But it’s amazing. It’s a really good book, even though I’ve written it and I say so myself and I look at it and think – ‘Did I really write that?’ But yeah I’m really proud of it. I love it and I hope you’ll love it too. So Break Through The Barriers Of Redundancy book will be out soon and I am so excited. Thank you for being on this journey with me. I have a ton of Bloggers, Facebookers and Tweeters, who have followed my journey for quite some time now on getting this thing published. Love to you all X. I really appreciate it. Until next time, Embrace Your Quirky and each others. Bye. Keep embracing your quirky and believing that your dreams can come true. Thanks for all of your love and support during my journey into print – Well into a Kindle at the very least!